Let’s face it, despite their quirks, these cute dogs with Pug face wrinkles and Beagle features have wriggled their way into our hearts. A Puggle owner’s priority should be to feed their furry friend a diet of premium dog food that will support their high-energy needs and give them the right nutrition. So what are the best foods for your Puggle? A Puggle is an adorable cross between a Pug and a Beagle that makes a great family pet. This breed is friendly towards children, strangers, and other dogs which can be a big bonus for busy families or active singles. Puggles are also known for being super cuddly and enjoying a short nap on their owners when the opportunity presents itself! Since this is an energetic and healthy breed, owners should be happy to hear that they don’t suffer from as many health issues as many pure-bred dogs do. A versatile breed, Puggles do well in apartments and in rural areas but their owners should make sure that they are getting enough stimulation and activity either way. Puggels are known for barking and howling at times and they love to dig, so owners should stick to their training if they want to discourage their Puggle from these bad habits. This breed inherits the Pug’s and Beagle’s stubbornness, but with positive reinforcement and engaging training, owners can have a happy and obedient Puggle. Known for loud howling if they don't get enough exercise or are left alone for too long. Hip dysplasia, patellar luxation, epilepsy, hyporthyroidism, cherry eye, stenotic nares. What to feed and how much to feed a Puggle? It’s no secret that Puggles love to eat, but they should never have food out all day. This breed isn’t very picky about what they eat and will eat a lot, until they get overweight and unhealthy if their owners aren’t careful. Puggles should be fed high-quality dry dog food only, since more common brands often have corn, wheat, and other ingredients many dogs are sensitive to. Trusted blends like Merrick, Canidae and Blue Buffalo are a few grain-free adult dry dog food options that are available. These brands priorities dogs’ overall health and contain great whole ingredients like meat, fruits, and vegetables so that dogs get a balanced diet. As mentioned before, Puggles should not have food available to them always. Owners should be particularly careful to measure out their Puggle’s food and avoid overfeeding them, because this breed will easily become overweight - so they should be put on a low-fat dog diet. Owners can choose to spread their dog’s meals to two or three times a day. Puggles should always have a bowl of fresh, clean water available. When deciding how much to feed their Puggel, owners should start with the directions on their dog food packaging. Factoring in the dog’s weight, age, and activity levels, owners should determine how much their dog should get for each meal and stick to it. It’s okay to make small adjustments if needed, and owners can always consult their vet if they have any questions. The main thing is to monitor a Puggle’s weight and make sure they get out of their comfy dog bed and get their daily dose of exercise. This breed may always seem like they are hungry, but it is important not to give in to them! Hip Dysplasia is an inheritable disease that causes a malformation of the hip joints, where the ball and socket don’t fit properly. Some symptoms of Hip Dysplasia include difficulty standing, reduced activity, and avoiding stairs or jumping. Owners who want to do their best to prevent Hip Dysplasia can look for ingredients like glucosamine and chondroitin in their dog’s food, since these are included in many premium blends to help support dogs’ joint health. Unsure how to recognize if your Puggle suffers from this condition, watch this quick video for helpful tips on how to spot it! Patellar luxation is essentially kneecap dislocation and is one of the most common joint problems in dogs. It is also more common in female dogs. Owners can tell if their dog has a dislocated kneecap is they are skipping or lifting their hind legs, move their hind legs in a strange way, or can’t walk on one or both legs. Watching a Puggle’s weight and feeding them a healthy diet can help prevent these types of joint problems. Hypothyroidism is a common disease in dogs that often affects them between 4 and 10 years of age. The underlying causes of this disease involves irregular thyroid hormones and some of the symptoms are hair loss, weight gain, excessive shedding, and lethargy. Diet may not be enough to stop a dog from developing Hypothyroidism, but premium dog food does have better ingredients for managing a dog’s weight, for their skin and coat health, and for increased immune support. We have recommended this brand before for other dog breeds and for good reason. This food is rich in protein with almost 43% derived from turkey, duck and salmon meals. Not to mention this product line is grain-free. 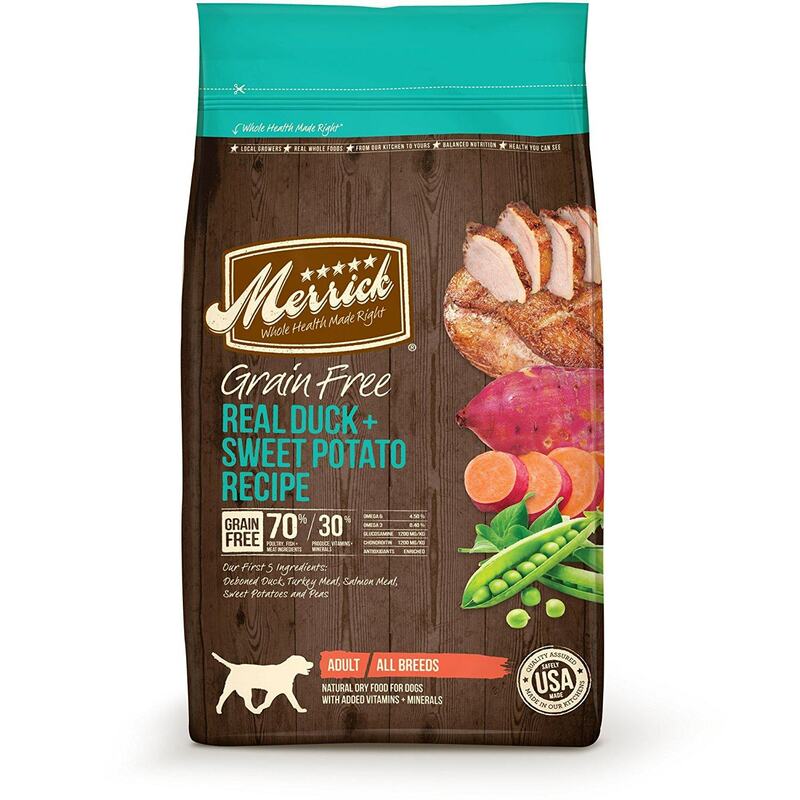 According to Dog Food Advisor, Merrick’s product line offer a 3.9% fiber content , 38% protein, 17% fat and 25% carbs, which provides for a very balanced diet. The sweet potato offers good carbohydrates composite but also contains white potatoes also (so beware- in case your Puggle is allergic). In addition to being packed with protein and carbohydrates, there are also apples, blueberries and whole peas in this recipe adding to its overall nutritional value. Overall, we stand by this grain-free formula from Merrick and is a regular on our pup's daily intake and often find it's all he wants to eat. 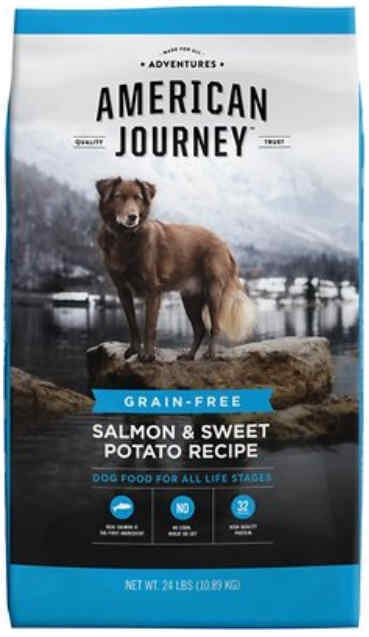 A grain-free fish diet like the American Journey Salmon & Sweet Potato recipe is a great choice of food to feed Puggles with allergies. This high protein kibble is grain-free and has deboned salmon as it's first ingredient. This is a great source of protein, rich in omega fatty acids and glucosamine and chondroitin to foster joint health. It's also supplemented with flaxseed and canola oil which support healthy skin and coat. 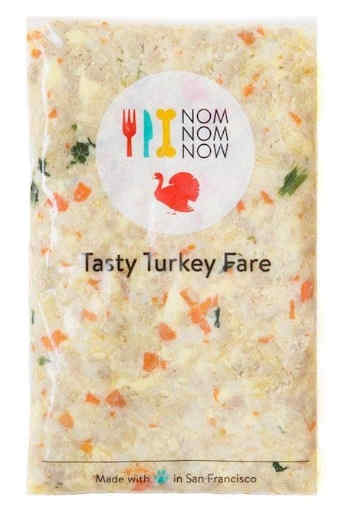 Other notable ingredients include chicken meal, turkey meal, sweet potatoes, chickpeas as well as wholesome fruits and veggies like carrots, dried kelp and blueberries. This affordable food is for all life stages and for dogs of all breeds so a great choice if you have multiple dogs. Dogs on this dry kibble have benefited from firmer stools, shinier coats and increased energy levels. It has only 390 kcal/cup so good for overweight Puggles who need to lose some weight but not sacrifice on nutrition. It is one of our best value foods, made in California, USA and is Chewy's own in-house brand. Currently running a special promotion of - buy 1 get 1 free. 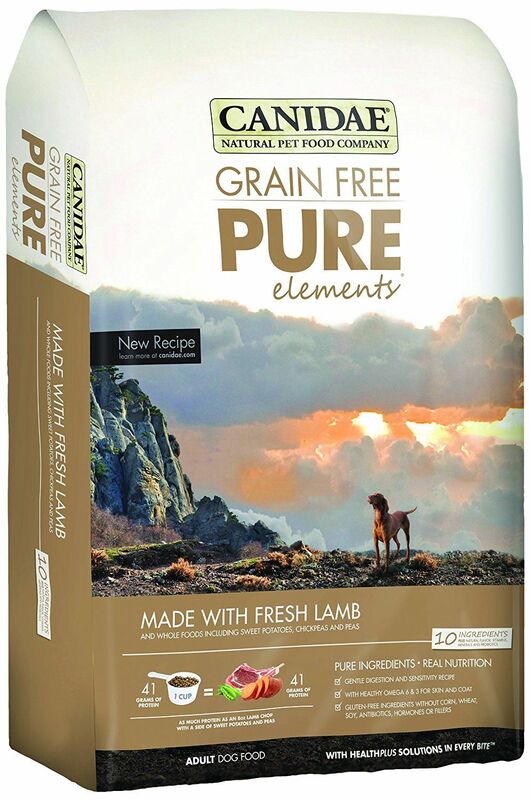 The CANIDAE Grain-Free PURE Elements with Lamb Limited Ingredient Diet Adult Dry Dog Food is an affordable and quality formula suitable for pups, adults, seniors. It is widely acknowledged as a great food product and is rich in protein. It is a very close competitor to Merrick albeit a smaller company too. Its composite provides a protein-to-fat ratio of 52% which is excellent and both the protein and fat content are above average when to other dry dog food. Similar to Merrick its carbohydrates come from sweet potatoes and vegetables and its protein from chicken meal, turkey meal and lamb. This recipe is particularly suitable for dogs with sensitive digestion since it uses just 10 key ingredients and is free from grain, corn, wheat, soy and gluten, with 509 kcal/cup. Canidae Grain Free Pure is top rated product and your Puggle will thrive on it as have many other dogs. Like Merrick, Blue Buffalo similarly sees the added benefit of both high-quality protein and vegetable-based food products. Their Life Protection Formula of Chicken and Brown Rice for adult dogs contains real de-boned chicken, whole grains, peas, whole potatoes, fish, carrots, sweet potato and fruits (Blueberries, Cranberries) along with flaxseed. Flaxseed is natural source of Omega 3 and 6 Fatty Acids and this is vital to your Puggle's health concerns regarding Hip Dysplasia and Hypothyroidism which it will help prevent. Another benefit is that this recipe contains a precise blend of calcium and phosphorus to promote strong bones and to protect your Puggle's teeth. This recipe contains 24% protein and 14% crude fats, with 378 kcal/cup. Overall Blue Buffalo is a good quality brand which I have used for many years for my own dogs and comes highly recommended by other pet parents and their dogs. So, What's the Best Dog Food For Your Puggle? While all three dog food brands are perfectly great solutions for your Puggle’s nutrition, the overall higher quality of its product makes Merrick the clear winner in this particular match-up. The choice however is entirely yours to make!